I think of myself as a positive and hope filled individual and it’s because of my faith. I attribute my faith to the eye witness accounts of the life and ministry of Jesus, his death and his resurrection. These accounts happen to be recorded in a book called the Bible,specifically the writings of some of Jesus’s disciples - Matthew, Mark, Luke, and John. These letters along with others recorded in the New testament by other eyewitnesses or people of the time, all speak to the “Good news”. One of the reasons I find the gospels so believable is that at the same time they appear so unbelievable. If the writers were trying to convince me, a mere man to their way, they most likely would not have written much of what they did unless it was true. They wrote it because they saw it with their own eyes and as a result believed. Not because it was of any physical benefit to them because most of them died brutal deaths because of what they believed. To them it was undeniable because of their eye witness. I can see that there is darkness. It exist everywhere and we cannot deny or avoid it. John's description of Jesus tells us that in him there is light, but unlike darkness that is unavoidable, we have to choose the light. We cannot earn the right to walk in the light we have to choose it. Because we don't have to earn it, it is not dependent on talent, skill, attitude or health. So essentially, it is for everyone, yes everyone. I find the act of believing to be somewhat of a mystery because it is so simple, but yet for many, it is not easy. It is hard. People are not attracted to hard things. They are attracted to easy things. But if we are honest with ourselves, it is the hard things that typically produce the most fruit, valuable lessons and positive changes in our lives. To me, believing in the hope found in Jesus is not a religion. The religious people in Jesus’s story were the darkness that killed Jesus. Hope is not found in religion. My hope is found in the person of Jesus, God’s son. The fact that he lived among us, died a brutal death, and then rose and physically appeared to so many, is more than enough for me. About this, I am specific and I am sure. It is common knowledge that to become an authority on something, a heavy dose of focus on a single subject or genre is required. But what about me, the happy generalist? What am I an authority on? I have seldom felt like an authority on anything, I feel more like the Heinz 57 type person. Very non specific. I often feel strongly both ways. Some would say I have an open mind, others would say I am wishy washy. I have a wide range of interest, I like to do many outside activities not limiting the majority of my time to a single specific one. I like to create and lead businesses, it often doesn't really matter what kind of business. If it has purpose and serves people I can find myself all in.. I like to be involved civically. I guess in a way I tend to be more specific here, I like coaching youth, but there again it doesn't really matter much which sport or activity it is. When my son found his love for music and theater, something I know nothing about, I found myself striking the stage after performances or chaperoning their trips. After coaching basketball for close to 20 years my daughter fell in love with soccer, so I learned the game of soccer. I have eclectic variety of friends and family with different tastes, faiths and interests. I like them all for their individuality and diversity. Speaking of faith, this is one area where i feel my journey has led me down one specific road. But it has not always been that way. More on this next week. When my wife and I would share at Marriage Encounters events they had a saying. “Feelings are neither right or wrong, they just are.” Are some of us just destined to be nonspecific generalists? Not because we are weak or non committal but “ just because we are”. Sometimes when I come up with a creative idea, I tend to hurry to share it and don't practice due diligence. It’s important to use caution and wisdom, to not cause harm to others, to my idea or reputation - harm that could come by shipping* an idea or product too early. However, if I wait for my idea to be perfect I may never share it or get credit for it.. At some point it has to be good enough, if not perfect. Here is my struggle. I often find myself wanting to get it out there first so I will benefit by getting credit for it. It’s difficult to create, for no other reason than that others can benefit from our creation. I would not care who gets the credit. I would just be happy that the idea or service is out there helping and solving problems. I would collaborate with others in hopes of making the product or idea better. I would not fear my idea would be stolen and just keep it to myself. Fear of theft or ridicule can cause us to hide our true gifts to society. I would be more concerned about the integrity of the product than who gets credit for it. If my main concern is getting the credit, I’m likely to ship something inferior, or before it’s time. Knowing when a creation is good enough is not a clear cut science. Drug companies don’t just settle for good enough when people's lives are at risk. There is a danger in putting things out too early.. But, It’s important that I don't succumb to the opposite, which is waiting until the idea or product is perfect. Getting something perfect the first time is unlikely, maybe impossible. If I’m waiting for perfection, it is a good bet that I will never ship the idea. At some point I have to decide that the benefits outweigh the risks. There is no clear cut answer to the “when” question, but it is something that I carefully think about and contemplate. There is nothing black and white about the right time to ship and share our product or idea. There will always be risks involved, but I contend if somehow and someway I can take myself and the need for credit out of the equation I will make the best possible decision on the “when” question. Time to think. How is your credit score? *To Ship, (I don’t think you will find this term defined in the the dictionary this way.) A term often used by author Seth Godin to describe publishing or acting on a plan or idea so as to expose it to the masses or public. One of the many great principles that organized sports teaches is the value of “showing up”. You may ask, how is something as simple as showing up a great principle? Isn't it just an expectation of any participant?. Yes it is, but showing up teaches a valuable lesson. We discover the true potential or value of an individual, or a team, when there is a strong commitment to showing up. As a coach, I enjoyed helping to shape and mold young people through the sport or activity I led. One of my jobs was to help them find their sweet spot, that thing they loved to do so much that showing up ceased to be a problem. In fact, if not being able to show up and participate was heartbreaking for them, I knew I had found their sweet spot. Often finding this place took time, courage, risk and vulnerability. I sometimes had to move them around a bit and try them in different places. From time to time, a player who had been on the team would choose to do something else. I would find myself wishing they would come out for the team and wondering if I had failed to be a good enough leader. I wasn’t satisfied that they were already a part of something else. I just wanted them on my team! I can now honestly say I have grown past the point of wanting everyone on my team. More importantly I no longer feel like a failure when those I lead make a different choice. What I now find important to me is that everyone is showing up somewhere. If they are adding their God given value where they are, being generous with their talent and their time, encouraging others and showing their love for the game or cause, then I am happy. The thought for the week is, are you showing up somewhere? And how do you know if your showing up where you’re supposed to be? I think it is as simple as this - will you be missed if you are not there? It’s not all about your physical talent or ability. Your support, encouragement, work ethic, and leadership are other necessary ingredients of a well functioning team. If you don’t show up, will you be missed? I challenge you to ask the people you show up with if they would miss you if you were gone. You might be surprised by their answers and the reasons they would miss you. It’s likely not what you would think. I believe there is a place, a sweet spot, for every humble soul. Now, find yours and go show up! So why is it that I feel the need to write my thoughts in this blog? Is it because I know so much, that I must impress you, so you can have success and fame? This is hardly the case, and actually, the near opposite is true. Writing my thoughts and experiences is one of the scariest things I have done to date. There is this small voice in my head that tells me that I have nothing to offer others. Have you heard that voice saying the same thing to you? I have always enjoyed writing a Christmas letter at the end of each year to send to family, friends and relatives. Outside of the worries of spelling things correctly and using proper grammar, this felt like an easy task to me because I was just writing about actual events that had taken place over the past year. That’s simple right? Well, not really because when you start to write about others in the family, they may not want to be written about, and to write only about oneself feels self centered and narcissistic. These negative thoughts, true or not, have kept me from writing for the past several years. Back to my blog, This blog’s intent is not to tell anyone how they should live, lead, do business, or coach. It’s not to show people that they are loved and appreciated. I believe the ways to effectively do these things are as numerous as the stars in the sky. I now write as an act of generosity. Yes, to share one's thoughts, feelings and experiences, I believe, can be a very generous act. Just the fact that deep down I wonder if I have anything to offer, should not keep me from offering what I have. Whether it is of any use to you, “the reader”, is not for me to decide. But if for some reason it is, shouldn’t I muster up the courage to put it out there? Up to this point in my life I have kept a journal as a simple act of reflection and working things out in my own head. I haven’t worried about spelling, grammar or making sense to anyone but myself, because I was the only reader. I always found this simple habit to be therapeutic and beneficial to my own soul. Now I am going to be brave and generous by sharing some (not all) of those thoughts, experiences and lessons with you, my friends. No pressure, as I know it’s not for everyone, but thank you for considering that it may be for someone, maybe not you, but for someone you know and care about. I have benefited so much from reading what others have generously shared with me through books, blogs, videos and social media posts that I desire to give back. That is why I write. As my good friend Gary always says, “Life is a gift…. live it!” I would humbly add “ and share it”. You are invited, as difference makers, leaders, family members, friends, business associates or total strangers to subscribe to my blog. I feel compelled to share my experience and encouragement, as an entrepreneur, leader, and youth sports coach, with those who might benefit from it. I will post once a week, on Friday mornings for now (maybe twice if something really exciting is happening). Each post will be short, a few paragraphs, and include an applicable experience or thought for you to contemplate. After reading (five minutes at the most) I want you to feel free to respond with your thoughts or experience as an act of generosity to fellow readers on the subject or simply share if it was of any use to you. Is good leadership the result of good people skills or experience? Which trait of a good leader is most important? The obvious answer is both, they are equally important. If I were to choose a coach for my children’s team I would ideally chooses someone who was relationaly healthy, could cast vision, build trust, establish loyalty with a high commitment level, and understand the generation they lead. I would choose someone who was humble, had a heart of service, and was full of love. At the same time I would look for someone who had a lot of first hand experience. They would have had years playing the game, or many years of coaching and mentoring. Their experience would have led to a good working knowledge of the fundamentals, the rules and the tactical options of the game. I think we would all agree that we would love to play for a coach like this. Or, switch to the workplace. Maybe this is our employer. We would love to have a boss like this, wouldn’t we? The unfortunate reality is that there are more leadership positions out there than there are people, gifted in both of these arenas, to fill them. I would actually contend that this person is extremely rare, if they exist at all. So what is the answer? I believe it is the team builder. The team builder is someone who has enough people skills and enough technical knowledge to be “dangerously proficient” but is humble enough to surround herself/himself with others who can make up for each other’s deficiencies. Creating and organizing like this can be difficult and messy, but once it has been accomplished it can be a much stronger form of leadership than the single talented, dynamic leader. A leadership team where there is trust, accountability and diversity has the potential to be a strong form of leadership simply because there is more ability to withstand the troubled times. A well crafted and balanced team can lose it’s best player and still remain competitive. A team that depends wholly on the gifts and talents of one player crumbles when that player goes down. Are you a team builder? Or more likely, and maybe even more importantly, are you a part of a team someone else is building? Both positions require good choices on the part of the individual. Learn and grow daily so you can bring your best to the team in whatever capacity you may serve. Being part of a leadership team is belonging to something bigger than yourself. It’s an important part of bringing purpose and meaning to life through your everyday work. I have a hard time admitting this but I have never actually had a budget, personally or for any of my businesses. I am not endorsing or recommending my approach to handling finances but, in my experience, I have always struggled to see value in creating a budget, especially when I would just ignore it anyway. My thinking has always been, how do I take advantage of potential opportunities if I am bound by a budget? There is no line item in most budgets for “unexpected opportunity” costs! Maybe this is just the plight of an entrepreneur - I never know exactly how much it might cost to make a new opportunity work out, or if it does work, how much profit will there be in the end? Without knowing these things how can I budget for them? I have been on church and organizational boards where a budget has been a necessity and a very good thing. I can see the value of this whole process in many situations. But for my endeavors and unconventional approach I just could not seem to make it feel like it was worth it. Or maybe I am just foolish and a bit crazy. So you might ask, if you don’t have a budget how do you manage your finances? I have a couple of simple rules and they have worked well for me. I will not carry any debt that does not produce,or have the potential to produce, income. I use credit cards but do not carry debt on them. Autos or “toys”are not things I want to carry debt on either, because they don’t produce income or appreciate in value. The exception to this was my home mortgage. I have to have a place to live and this is one of the few non-income producing purchases that is highly likely to have the same or increased value over the purchase price when I decide to sell it. Always be building some form of net worth through a income producing business, rental property or real estate investment. Again the guideline for me has been that these investments have to not only pay their own way, but they need to also provide enough cash to pay my living expenses, mortgage and credit card bill. In the early years I had to start my first business while I had a day job working for my father's excavating business. Once the business matured to the point where it could support my living expenses, I quit my day job and started another business. Get the picture? One business would support me until the new business could become profitable. In some cases I had to abandon the idea because it wasn’t working. A few times I got to a place where I could not meet my expenses or pay my credit card balance in full. That was my red warning flag. I needed to spend less, earn more, or sell something. But either way, I benefitted. I would build something of value or I would learn a valuable lesson. This process worked well for me because it forced me to live within my means yet, at the same time, save through the equity I was gaining in my assets. An asset to me is something that produces regular income, pays its own operating expenses, and over time will sell for at least its original purchase price (and, in all likelihood, more). This is how I have intentionally attempted to build lasting wealth. Slow and steady over time. Is a strict line item budget a wise strategy for you? It may be, but for me and my financial planning, these simple rules have been the most valuable. The American Birkebeiner came and went and as we posted a couple of weeks ago, it took over 2500 Volunteers to pull off this 3 day event. Our job this weekend was in the food tent and our mission was to feed soup, bread, bananas, cookies and drink to approximately 10,000 skiers over two days. The food tent was huge, reminding me of what the tents might have looked like in one of my favorite TV shows, MASH. Big propane furnaces blew hot air into the tent, bringing the temperature up from the low teens to near 50 degrees. There was dim light and the floor was a combination of snow, ice, mud and standing water. Despite the unusual working conditions, and the long hours, the food tent volunteers just seemed to rise above the normal chaos and got the work done. There were smiles and good-natured banter as the soup pots were stirred and the tables set up for serving. Volunteers had set their own “normal chaos” aside for the time and had smiles for the tired skiers as they filed through. The people we worked with and the skiers we served were all amazing and the work got done! Local groups of coworkers, families, and even visitors from other states stood shoulder to shoulder serving others with no monetary reward at the end - just a hat, a pin and a ticket to a volunteer party. The networking opportunities were there, like I had imagined. I saw friends and neighbors I hadn't seen in years. There were people who had traveled from as far away Chicago and the Twin cities just to volunteer. There were vendors, like the GU people from California, serving up samples of their products.. All around us other groups of volunteers were doing other tasks, like timing, security, crossing guards, and the baggage handlers. Whenever there were shortages of help, the race chiefs shared resources and people. The spirit of cooperation was so cool! Years ago in high school I was a volunteer baggage handler and that is another enormous job, as amazing as feeding 10,000 skiers. At the start line, the skiers put their jackets and dry gear in bags and backpacks with their bib number on them. These are loaded in trucks and hauled 25 miles down the road to the finish line. (My memory from way back was riding in the back of the truck with the bags! Not how it's done now.) At the finish line they sort the bags by wave and number and give them to the skiers when they complete the race. Imagine sorting out 10,000 bags to be easily found by their owners! It was the way it should be, all hands on deck, complete the mission, serve the participants and fellow volunteers. I saw lots of evidence of what is good and noble in people. The skiers were especially grateful for the volunteers and were constantly thanking those that served. The whole volunteer experience met my expectations and more. Will I do it again? Heck ya! And you should too. See you next year at the Birkie! My oldest brother once told me this joke. How do you catch a unique rabbit? Unique up on it! “I should be farther along than this”. I contend that these are natural feelings of every career minded person, but at the same time this is a very dangerous road to let the mind travel. Don’t do it! It will cause you nothing but harm and likely lead you to take shortcuts and make bad decisions that you will regret. I am not saying you shouldn’t analyze and assess results of your decisions and take corrective action if needed. This is a “must”. I am encouraging you not to use someone else's path as your gauge of success. This is why I think that doesn’t work. For some people success is determined by how much they have given away, or the hearts and lives they have touched and inspired. Some people like to work alone and others prefer to train and equip others to work with them. Some possess a unique talent or art while others are just born leaders or communicators. We are all different. Expecting “same results” from “different talents” is going to lead to disappointment. We know that every person is different in some way, created wonderfully unique, like snowflakes. So why should every career track or business be the same? Sometimes uniqueness is hard to accept. We prefer to have a formula, something we can follow to guarantee the same predictable results as every other person gets. It took me awhile to see and appreciate the value of uniqueness, especially in the business world. I would love to say that, when I came upon this realization, I quit comparing myself to others. I didn’t. Every time I begin to go down the “whoa is me” trail, I start to compare myself again, and it never leads anywhere productive. What I can say is that I recognize this destructive and useless path sooner, and accept myself and my business for what it is. Not for everyone, but for someone. Unique and wonderfully made. Each year, late in February, one of the world’s largest ski events, “The American Birkebeiner®”, takes place in Hayward, WI. An event of this magnitude would never happen if it were not for its volunteers. This race, for most a ski through the woods, requires an insane number (2,500) of volunteers each year to pull it off. The population of Hayward is hardly 2,500. So, how do they do it? I’m not sure. But here are some reasons why they do it. There are health benefits to volunteering. I know from my experience that after you volunteer for something, you simply feel better. Serving others, without being paid, is an amazing feeling. Do it and you will understand. Volunteer opportunities often get us up, out of our chair and moving, and that is always good for the body and mind. Volunteering almost always involves working with or for other people. When you volunteer side by side with someone, you can develop a kindred spirit with these people. Just the act of serving with someone can create a bond and a relationship that can bridge cultural, religious or political divides. I have experienced this. “Warning!” It can be habit forming. This is why some people resist raising their hand and volunteering. The thinking goes like this, “If I do it, I most likely will want to do it again, and who has the time? I think I will just give them $10 and let someone else do it”. It is good to have boundaries and yes, there are times when it is wise to let someone else do it. But if you find that you are never that “someone else” it may be time to examine your life and think about what and who you are living for. You may be surprised what you find. I love to volunteer, but have to admit that it has been some 30 years since I have volunteered for the Birkie. This year I will be that “somebody else”. I look forward to the experience of feeling a kindred spirit with 2,500 other people from Hayward all over the world that come to help out. I know there are spots still open for this year’s Birkie for those who are interested. Is there a similar event or organization near you that could use some help? Consider volunteering, even if only for the health and networking benefit it will bring your way. Did you know that the future of your next event could depend on your recognition products and the name they bear? What you give and how you present it is very important! There is a reason why many events give every participant a t-shirt. And no, it’s not because you need more t-shirts. You’re given a t-shirt in the hope you will wear it, and by wearing it you are helping to promote the event name for the future. T-shirts are one way, a good way, but not the only way. At Apple Awards we provide recognition products for the American Birkebeiner®, the largest ski race in North America and second in the world. The organizers of this race are professionals who know the value of promoting their name to all 13,000 participants. Each one goes home from this event with multiple items that are personalized with their name. In the past couple of years they have gone through a major branding overhaul to create easily recognizable and trademarked images, colors and logos. They have done a masterful job of placing these images on every medal, pin, plaque, shirt, race bib, or gift that goes home with a participant. These items are displayed in homes and offices all over the world. They are conversation starters and reminders for the participants. They are key elements of branding and name recognition for future events. Even non athletic events give tokens, like the brass medallion with its raven icon from my altMBA course this fall. It’s sitting on my desk as a daily reminder of my participation, and at times a conversation starter with visitors. Here at Apple Awards we’ve had a paradigm shift as we think about why and how we produce recognition products. It has expanded our purpose from just being producers of awards, to being marketers, helping to promote future events. If you run an event, big or small, have you thought about the importance of sending something home with each participant, something that boldly display’s your events name on it? Let us help you work on the future success of that event with our wide variety of personalized recognition products. It’s all about your name. If you’re not moving forward or growing, you may be standing still or even moving backwards. What does this mean? I probably don’t have to explain to you what growth looks like. It is a condition of the mind, it is intuitive to life and anyone knows if they are growing or not. The hard part is admitting lack of growth and doing something about it. Choosing to grow is a choice, like exercising or eating healthy. Reality is that the world, and the way we do things, is changing faster and faster. Keeping up with the pace can be really hard. Since I contend that a growth and service mindset is essential to relevance in today’s marketplace, I had to consider the “keeping up” factor before I went into business. Here’s how that looked for me. Both award businesses I bought were at a point where they were experiencing years of declining sales. A small business naturally loses a few customers every year due to attrition. Customers die, they retire and move on to other employment. But the key to a healthy business is whether it can consistently replace those customers lost to attrition with new customers. Don’t misunderstand, both of my businesses still had many good loyal customers. Their products, for the most part, were good. The service they provided was good and relevant. Those were the reasons I bought them. Both businesses, in my opinion, were declining because their owners were either unable or unwilling, for various reasons, to keep up with the changing structures and technologies in today's business world. These were growth problems. Just to clarify, growth is not always about making things bigger. Sometimes it’s a requirement just to keep things the same. For example, a business may be in a geographic area or a competitive market where there are only so many customers, and this is okay. But growing is still necessary to address natural attrition and keep the customer base large enough for the business to remain viable. Even when I was working for someone, growth was no less important. I knew if I didn’t grow I could become irrelevant and easily replaceable. The best book I have ever read regarding this is Linchpin by Seth Godin. This brings me back to purpose, if you have a purpose for doing what you do, I believe you will naturally want to learn and grow to satisfy that purpose. Your purpose could be as simple as providing for your family, or as difficult as providing clean drinking water for people that don’t have any. Both purposes changes the world for the better, today and tomorrow. What to do? Are you continuing to grow, learning through curiosity and taking risks? Do you need some inspiration? Check out this video How ya gonna Live? Answer these questions, and the world will thank you! Back in 2002 Rick Warren wrote a book called the Purpose Driven Life. What I believe Rick was trying to show us in this book is that life just goes better when we live it with purpose. Our true purpose in this life is not always something that is obvious to us. As a result of our own choices or choices made by those in authority around us, we can find ourselves in circumstances or an environment that makes our purpose easy to miss. So, how can we find our purpose? Early on in my adult life, I remember thinking that “doing” made all the difference in living a life of purpose. To some extent it was true. What I missed was, the “doing” is only part of the formula for finding purpose. It is the second part. Quickly, I learned that the only way I could feel good about what I was doing was if I first quieted myself enough to reflect and listen to what I needed to do. Being still - this was a really hard thing for me to do, and as I write this, I am realizing it still is, to some extent. I believe there are two primary ways to quiet yourself and work through questions regarding life, through meditation or prayer. Myself, I choose prayer because to me prayer is a conversation with my creator, the author of life. So, I guess what I am recommending is, learn to be still and reflect before action, but don’t forget you must also act. Through regular attention to both prayer and action I believe your true purpose in this life will be revealed. When you are still there will be competing voices for your attention, good and evil. One will tell you that you are worthy and one will try to tell you are worthless. The truth is that you are the first and if you don’t see that you may need some help. It’s ok, we all need help! Growth and Purpose: Is Your Ship Sinking? I believe the key to any successful life or business is a purpose (service) and a growth mindset. One without the other rarely impresses me. One of my favorite things to do while on vacation is to admire the creativity of business enterprises, big and small. Everyone from the airline we fly to the restaurants we eat at, the resort we stay at and the shops we visit. The longer we’re engaged with them the more we see their uniqueness and personality or lack thereof, come out. The same holds true for the people we meet. It doesn't take long to notice if the motivating factor for their life or enterprise is service or self. Soon, it becomes evident if the person or enterprise is growing, coasting or is declining. Without a servant heart and attitude there is very little purpose beyond $money$ in what and why we do what we do. When things get hard and money is scarce the dream can easily die. The natural illustrations are everywhere on this. Stop pedaling your bike and coast, eventually you stop and tip, the ride is over. The plane you’re on stops fueling the engines, and it starts to glide. We all know what happens next. True to the pattern, the minute I quit investing in my personal or career growth, the decline is soon to follow. First things will flatten out and I will glide on the momentum I previously had, then the downward trajectory will follow. I am convinced that this is a law of nature and no person or business is above it. Whether it is my business, job, relationships or my spiritual walk, I must take time to think about the why (purpose) and how (growth) regarding what I am doing. How about you? Take an inventory and ask yourself if you are growing, coasting or falling? If this causes you alarm or concern regarding your life or enterprise, take heart! Awareness and thinking about it is a big, first step. I’m going to be sharing some of my own thoughts on these important issues in the next few posts. Join me as I explore how to right the ship before it goes under and sinks. What would it take to change your mind? A compelling argument, or do you need indisputable facts? Let’s look at an issue that’s been debated as long as there have been contests and winners and losers. I actually believe in giving participation trophies. I don’t just believe this because I am an awards provider. I think it actually makes good sense. I believe participation is a big deal. Some believe that we should only award the best, the competition’s winners. If we award the participant we are sending the wrong message - that everyone is a winner just for showing up. But, isn't this true in much of life? Isn’t it the showing up and participating that counts? No one, not even the youngest of children, when handed a second place or a participation trophy after losing a contest, thinks they won the contest. But they can still feel proud and appreciated by the event’s planners for showing up and making it a contest. Think about it. If only the best team shows up, there is no contest. I believe a well thought out awards plan, even one including participation trophies, can serve multiple purposes. It thanks and shows everyone appreciation for participating and making it a contest. In February, one of the biggest single events that we provide awards for, The American Birkebeiner®, sends everyone, all 10,000 participants, home with a participation trophy - a medal or year pin signifying that they finished the the Birkie for the first or the 45th time. This is one of the reasons, I believe, that it is one of the greatest events on snow and it sells out every year! I learned about the dip during my enrollment in the altMBA. “The dip” is a term coined by Seth Godin the creator of this course. The dip is not something new and is definitely something that 100% of us (depending on how old you are) have faced literally 100’s of times in our life. The dip is that moment when something gets so hard that you feel like quitting. 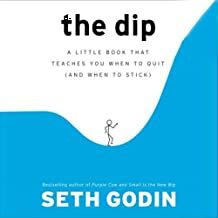 Seth wrote a book called “the dip” (yes, all lower case). Under the book title on the cover reads the words A LITTLE BOOK THAT TEACHES YOU WHEN TO QUIT (AND WHEN TO STICK). Wait a minute, is he implying that there are times when it is actually okay to quit when it gets hard? I was always told that “quitters never win, and winners never... " Could it be that at times the best strategy for winning is actually quitting? Here is the gist of this little book, and you don’t even have to pay me for the two hours it took me to read it. Yes, this is free gift, a late Christmas gift from Seth and I. Use it wisely and by all means share it. Quitting, as a short term strategy, just because you're in a dip, is a bad idea. "Never quit something with great long term potential just because you can't deal with the stress of the moment"
Quitting as a long term strategy, for good reasons, can be an excellent idea. When it comes to the point where customers look only at price and stuff like “free shipping” when choosing whether to do business with my company, something is not right. As a small business owner in today's marketplace this is a daily tension for me. How far can I go in discounting our products or services to match our competitors, and still feel like we can afford to offer what we we really want to give - great service and satisfaction? How far? I hate finding myself in that spot, that place where I have cut my margins so low that if anything goes wrong and I make it right, I may lose money. On my part, fundamentally great service has a cost attached to it, but I still want to feel good about standing behind my work. It is at this point that I have to remind myself that I can always find ways to earn back the money, but the trust - that is much more difficult to earn back. When customers lose trust, it can infect a business like a virus. The struggle is to convince myself and my customers that my product may be worth a little more, because the plan is to be around, for them, for the long haul. Design is important and a well designed product or gift can quickly and decisively communicate your message. However, if you are giving a gift to show someone how much you appreciate their contribution to your life, organization or team but fail to communicate specifically how you feel in words, your well intended efforts could be lost. Sometimes you can get lucky and just the act of giving a gift is enough, but when you take the time to communicate a feeling, a vision, the value you see in that person in words along with the gift, it can take an ordinary gift and turn it into extraordinary. In fact, the “what's it for?” is likely the most important question to ask when trying to show appreciation. The most meaningful, long lasting gifts, I believe, have a compelling “what’s it for?”. For example, what is the difference between a $50 gift and a $150 gift when both are exactly the same object? The difference in the $150 gift might be that it includes a part of you. You invested the time and mental resources to think of something to say. You took the time and energy to take the product to someone who could transform that object into a unique expression. It is the very same $50 object, yet the extra $100 investment represents a valuable, personal message of appreciation. Are you able to clearly and quickly identify the purpose of what and why you give, whether in the marketplace, your community or at home? If not, I believe it is worth taking the time to think and get a clear “what’s it for” in mind. Doing this could lead to enhanced relationships, more purpose and greater creative energy in your life. When I hear statements like this I think that I have to have a story that will convince everyone of my different version of the future. This is not a realistic goal - all we have to do is take a look at the political world and we know that convincing others is not easy. No matter how great our product, our service, our story, someone else out there is going to be able to match or better it. But each of us has a unique story. Often it is a simple result of our prior experience in life, who we know, where we studied, worked or what team we belonged to. The key to a good story, a better story, is making it our story - our believable, true, one of a kind story that others will benefit from. I am convinced that every successful product or service starts with a great story. What is your story? Is it true, believable and of benefit to others? During the altMBA course there was one consistent requirement for each project and that was action. After all the brainstorming, reading, and group discussions we were not done until we took action and shipped our work. How often in our daily life whether at work or at home do we talk a big story, invest large amounts of time researching and dreaming, only to not take action in the end? I know I do this. I would assume that you probably do also. Action makes all the difference, even if we get it wrong sometimes. What keeps you from acting? Is uncertainty holding you back?. If life is not turning out the way you had hoped, it may be because you are choosing not to take action more than you choose to act. I love the saying, “Sometimes you win and sometimes you learn.” I’m sure it was said by a coach. Regardless, both winning and learning come about from action.